Aqualand Marina, together with MarineMax and Atlanta Marine, will be hosting its largest event in some years, a major two-day boat show, auction and an invite-only party that gets underway on Saturday, June 26 and runs through Sunday, June 27. 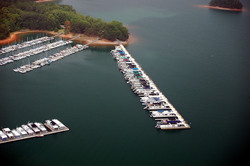 The drought appears to be over--lake's at full pool--and fuel prices are down significantly against last year's rates. The boat show and auction kicks off at 10 a.m. on Saturday. The boat show will feature boat displays out in the lot and in the water, including models from Sea Ray, Regal and and Supra, free demo rides and knowledgeable staff from both Marine Max and Atlanta Marine. An exclusive party launches at 6 p.m., with free beer and soft drinks, music provided by Audio Cage, and plenty of food available at the Dockside Grill. The evening party is by invitation only, and is open solely to Aqualand customers, and those invited by either MarineMax or Atlanta Marine. The fun resumes on Sunday, noon to 5 p.m.
Aqualand General Manager, Len Jernigan, sees the event as a necessary partnership between boat dealers and area marinas. "We have a responsibility to our business to support the boat dealers as best we can," he said. "Simply put, if they don't sell boats, we don't rent slips." The good news is that the economic outlook is nowhere near as bleak as had been projected over the winter. "Two of the three parts of our local (marine) recession are gone," he added. "The drought appears to be over--lake's at full pool--and fuel prices are down significantly against last year's rates." Still, Jernigan thinks it's a critical time for the industry to pool its resources: "The more we can keep people participating in activities on or near Lake Lanier, the better off we all are," he said. Aqualand's summer boat show reflects the marina's commitment to the local boating industry. Aqualand customers can pick up guest passes (limit four per slip) at the Ship's Store no later than June 26.